Last week I was talking to my friend Dharini and she asked me to put the recipe of these traditional veg. cutlets on the blog. This conversation of making these beautiful cutlets gave me a tour back to my childhood. The days, where my dad used to take me to this local restaurant name Gurukrupa in our city. Those were good old days when I still used to enjoy visiting restaurants and going for movies with my parents, until the puberty hit and teenage kicked in. Just kidding, I still enjoy their company and always will. So, the veg. cutlets and dosa’s were very famous from this restaurant we used to go. The problem was everything will sell out very quickly and if we were late we would end up eating only dosa’s and medhu vada’s and our craving for our favorite cutlets will lose its way. But, Dad being super dad almost every time, managed to take us in the hours when we will manage to get these beautiful cutlets. Isn’t it amazing how we like certain food from certain places/ restaurants only? Our love for Cutlets from this very restaurant is more than 25 years old now…. and it amazes me now when I think about it. What are Vegetable Beetroot Cutlets? The Vegetable Beetroot Cutlets are traditionally known as the Veg. Cutlets. 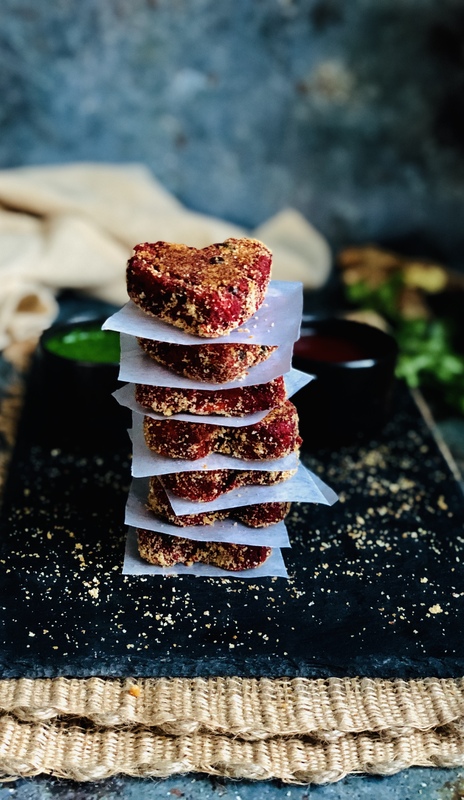 They are made by steaming or boiling Beetroots, Potatoes, Carrots and Green Peas with Garam Masala as the main spice along with some red chili powder, cumin powder and coriander powder along with ginger and green chili paste. These are traditionally deep fried or shallow fried. They are crispy from the outside and beautifully soft on the inside. This appetizer is enjoyed by families on a Sunday evening, or sometimes for breakfast and sometimes people make them exotically by adding coconut and roasted peanuts for guests. Can we make Baked Vegetable Beetroot Cutlets ? I personally almost try to avoid deep frying everything possible. These cutlets are one of them. As I mentioned earlier my friend asked me to blog the recipe of veg. cutlets and the condition was they should be baked, so yes, I made a baked version of these beauties. They absolutely bake to perfection, crisp from the outside and soft on the inside. These cutlets need a lot of patience while baking though, if you want them to brown nicely and have a crispy texture on the outside. It takes good 40 mins to bake them, but the outcome is so scrumptious and delectable , you just cannot resist. Vegetable Beetroot Cutlets are traditionally known as the Veg. Cutlets. They are an appetizer or a tea time snack and are made for special occasions too. These are made with Beetroots, Potatoes, Carrots and Green Peas spiced with ginger and green chili paste, garam masala, and some more spices. Boil the water in a heavy bottom Pot. Add Chopped Potatoes, Beetroots, Carrots, and Green Peas as shown in the photo in the steamer pot. Place the steaming pot on top of the heavy bottom Pot and close it with the lid. It will take about 10 to 12 minutes for the veggies to boil. If you want to pressure cook them Wash and rinse the veggies. Place them in a pressure cooker. Add about 2 Cups of water and pressure cook them for 3-4 whistles. I shredded boiled carrots and beetroots using my food processor. If you don’t have a food processor, you can use the hand shredder and shred the veggies. Mash the boiled Potatoes separately. Now place them all in a bowl as shown in the photo. Add Garam Masala, Red Chili Powder, Coriander Powder, Cumin Powder and Salt. Also, add green chili and ginger paste. Now add 1/2 Cup of Bread Crumbs and give it a mix. I needed almost a little less than a cup to make a dough ball from the mix. Line a Baking Sheet with parchment paper and preheat the oven at 375 F.
Before rolling your Cutlet veggies in a ball, taste it. Add the spices according to your taste if you feel something is less. Once you feel the perfect taste roll it into a ball. I used a Heart Shaped Mold to give them a heart shape, but you can give them any shape you like. Roll them into Bread Crumbs and Place them 2 cms apart on the baking tray. Before placing the cutlets in the oven brush them with some oil to avoid drying and cracks in your cutlets. Bake them at 375 F for 20 mins on each side. Serve them hot with Coriander and Mint Chutney, and Ketchup. This entry was posted in Appetizer Recipes. Bookmark the permalink.